As we prepare to welcome our second one into this world, I wanted to do something special, just like the last time. If you have been frequenting my blog, you probably know that my greatest skill is in putting one feet in front of the other. I decided to do it a few times and signed up for the 100k Bangalore Ultra. And just like the gestation phase, when you sign up for an ultra, there are things that people don't tell you about how much it hurts, how your plans can go awry, how it all ties up in the end, and how much, you life is going to change (for the better of course). All systems were GO. The all too familiar grind of the last week taper – one easy run, rest, sleep, sweet potatoes, pasta, salt, more sleep. I rode my bullet to the venue, picked up the racer kit (1 bib in a bag only), dropped off my chapatis for the 5.6k On The Run (OTR) baggage, some nuts and figs for the 0km OTR baggage, packed salt tablets from D, picked up a torch and was all set to go at the 5AM start. The physical part. Although I had planned to stick with D, he took off at a slightly faster pace at the start. Thanks to advice from Santhosh & Navin, I had no intensions of chasing him down. 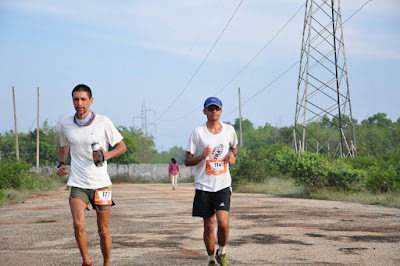 I caught up with Himanshu’s torch light, chatted up a bit, got some gyan on Ultra running. He had won the recent Javadhu hills Ultra 75k. We passed and out passed each other a few times till about 50km. On his advice and my own comfort level, I had started to walk for 5 mins for every 45mins or so of running. In an Ultra, he said, if you are in doubt, go slow. You have plenty of time to make up. Wise words, esp. since he eventually went on to win this one. Although my 5k OTR was not available till the second loop (and I missed it on the way out), I made sure I ate the PBJ sandwiches frequently. Then had chapatis and banana every 2 hours. In order to keep my nemesis, cramps, at bay, I had electoral every other km, but would have been wiser to stick to 1 endurolyte tablet/hour pattern. At 45k medical tent, I went straight in hoping for a pre-emptive stretch, but the medico was not in sight. Luckily, Lavanya (who was cheering) chipped in to help & she and Jaggi got me going again. 50k came in 5:30 and I was feeling good. I caught up with D, reloaded my salt tablet supplies, got some time at the medical tent for stretches and carried on. Now I was getting into phase II, time to stick to a rhythm. I tried to keep to 25-5, run 25min, walk 5min. I had stopped a few times to do about 3 half suryanamaskaras, to stretch and it seemed to put off the cramps. The first time it hit me hard, some 58k or so – my left calf turned to stone. Sanjeev (by then heavily complaining about his own race) Chennai runner came up from behind, eased me on the ground and gave my legs a vigorous shake, massaged my calves, helped me back up on my feet and trotted off. He went on to claim a podium finish for his 75k. Another couple of kms had me sit down on a mud heap for a tight thigh. And then again, it hit me bad on a bare stretch of trail, at around 65km. I slumped down straight into high grass by the trail side and was getting the knots off my calves. A bewildered Nari came along, helped me up. I remember telling him to place me in shade. But luckily as I got up, I felt ok. I decided to walk the rest of the loop, albeit briskly. From then on, there was no more lying down on the trail for me. When my Ultra guru said in his advice, “split the run into 3 halves”, I should have expected it to be some complex mathematical puzzle. But the last “half” was just simple mathematics. I finished the 3rd loop, 75km in 9h:38m. If I could make another 1km in 22mins, I would have gotten back into the forest trail for another 10k. But I decided to take a much needed massage at the medical tent (and made to wait a bit, since I needed to see the Dr. Niranjana). I was the first one at the U-turn for the curtailed route now. This meant that I had to put in 25km on a 1k-and-back loop on part tarmac and of course all walking (which is what I had resigned to, by now) at ~9-10mins/km for 12 loops! Simple math: 10mins a km, 6kms an hour, multiplied 4 times = 24kms in 4hours. Clap Clap Clap. The clap clap was provided by the hyper-enthu “Runners high” tent, who lived to their name. I stretched Navin’s generosity in getting him to serve me Pongal from the RH tent, twice! And Santhosh and Srini for sounding off the math every time we passed. God/Krishna – I thanked Him over and over and over again for the wonderful opportunity He had given me, for the life, the wife, kid(s), the family, the friends, for everything. (I may have missed my dear blog visitors, but I say it now – Thank You). Mindfulness – I tried to be “in the moment” most of the 14hours. Not thinking forward to the 65th or 99th km or 10hrs or tomorrow. Being in the now. Feeling the air that I inhaled, the beautiful trails, the sunlight, the butterflies that went around, the winds howling at times. Chant – I chanted the Gayatri mantra a few times (this got me into tears once) and did a few half sun-salutations on the course. No-Quit-Attitude – Never once did I encourage the thought of quitting, no excuses of a keeping family waiting for finish / peevish about getting back home. I had ridden my bullet to the venue and would ride back once I was done with the 100k. As for the cramps, I had to get past them, had to find a way. As I began to count down from 95km, somewhat glad that the end was near, but still wary that there was another 50mins of walking to be done. 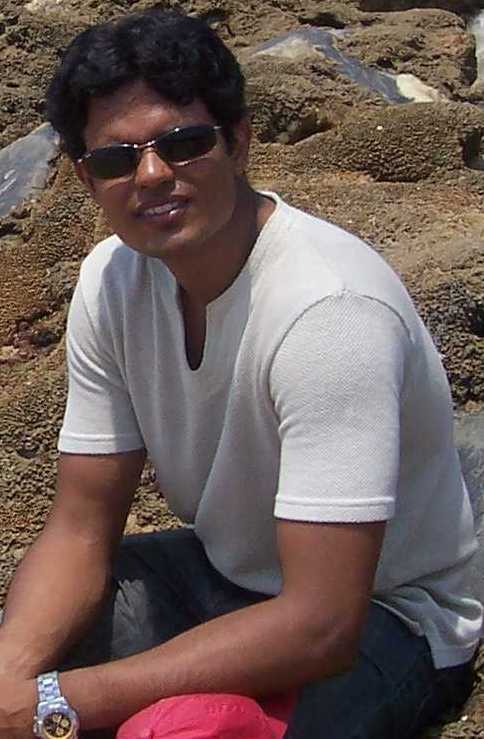 From 4 down to 3, Santhosh, Shuvi, Chandra, Sid Jr, Srini, Dharma – all passed on kind words. But as I walked up that slight uphill, for the 16th time that day, there was emptiness. Partly because RFL had this end for me in an obscure no-mans-land away from the start point and its associated revelries. And partly because there was no sense of achievement, I did it because I had to do it – this ultra was my baby, I had to deliver it. I walked past the timing mat 14h:18m on my watch, put my arms up in the air, walked to the aid station, drank 2 more cups of electral, walked the 1km back to the start area, passing my thank yous, picked up my medal, had a quick dinner and rode my bullet back home. Thanks to Shuvi who helped me with my bags to the parking lot, then with my bike and rode ahead ensuring that I didn’t lose my way back home.